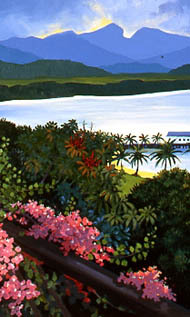 Tropical Flowering Trees Enduring Theme For Oil Painter, Tania Heben. 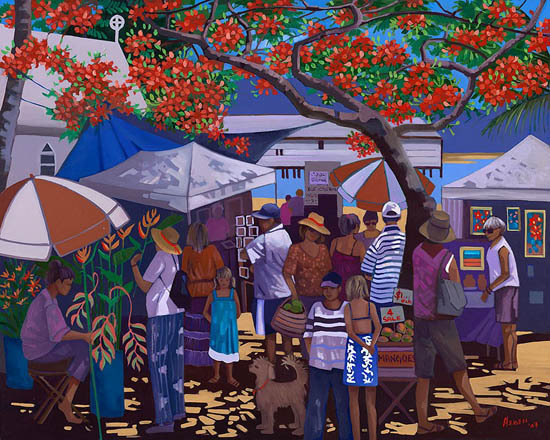 Tropical Flowering Trees Are Favourite Painting Subjects for Tania Heben. 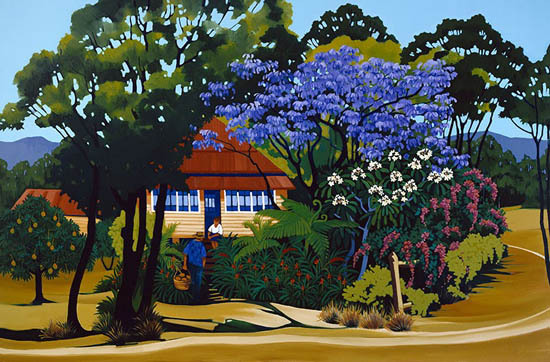 Tropical flowering trees and rainforest flowers such as orange heliconias and red ginger flowers, set in the distinctive landscape of North Queensland, have been an enduring theme of Tania Heben’s oil paintings for decades. Spectacular, brilliant red poinciana trees, the golden pendas and purple jacarandas burst into bloom. Blue and pink water lilies, floating on the surface of billabongs attract jacana birds to walk on their leaves, searching for food. Gardens, parks and bushland come alive in November and December, as if to herald the approach of the annual monsoon in this tropical rainforest climate. 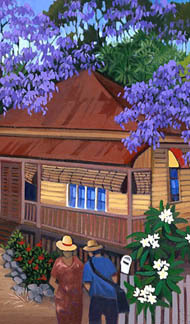 Purple flowering jacaranda tree shades a typical North Queensland house. Colourful flowering trees frame and give shade to ‘Queenslander’ houses, ‘high-set’ on stilts to take advantage of passing breezes and to be safe from occasional floods. 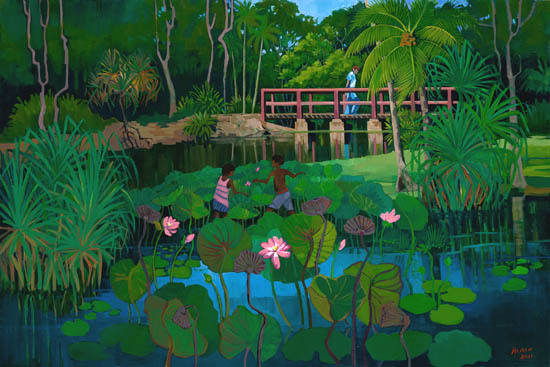 They line streets and country roads or find their way across hillsides, giving a splash of lively colour to surrounding dark green jungle. Of recent times Tania has been bringing some of these wonderful blossoms indoors to become floral studies or still life paintings. 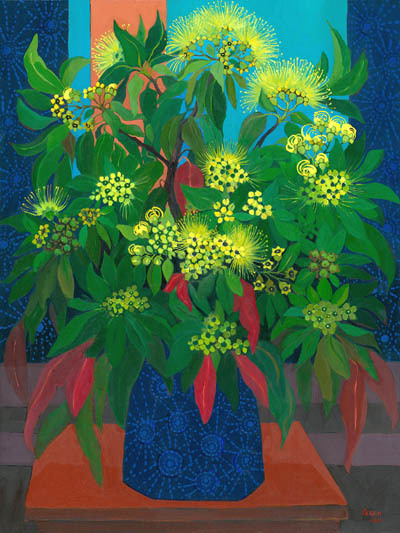 For her exhibition at Cairns Regional Gallery in September 2011, opened by actor and theatre owner, Diane Cilento, this new painting was created in honour of famous Australian artist, Margaret Olley. 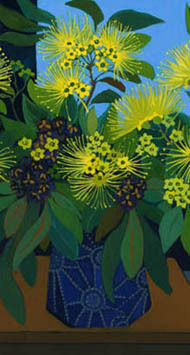 The golden penda (xanthostemon chrysanthus), floral emblem for Cairns Regional Council, is one of Tania’s favourite tropical flowering trees. This attractive, medium sized rainforest tree, with glossy dark green leaves and spectacular covering golden blossoms is native to the coastal strip between Townsville and Cape York. The golden penda is commonly used in road verges, as windbreaks, for hedges or in home gardens. It is related to the eucalypts and bottle-brushes, evident in the way that the clusters of long-stamened, bird attracting flowers grow. 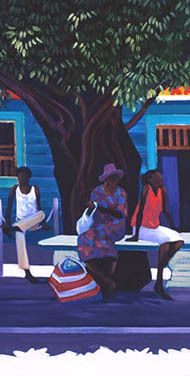 Tania’s oil painting techniques involve deciding on the composition of her painting, blocking it in with thinned down paint, then gradually building the layers, often from darks to lights with paint that is increasingly thicker than previous layers. 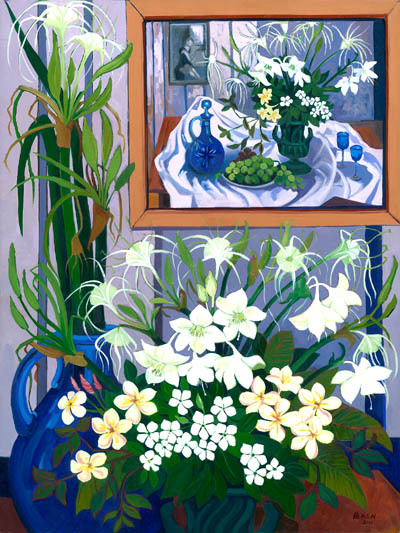 Details and adjustments come last, whether that’s a landscape with tropical flowering trees or a carefully positioned still life or floral study highlighting rainforest flowers. 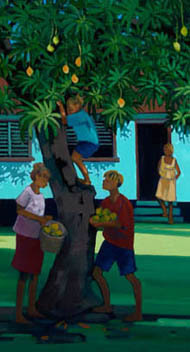 Should you be interested in commissioning Tania to paint a particular scene of flowering trees, a still life composition or special landscape, the process would begin with discussions with her, followed by sketches, which give your ideas concrete form. If you are happy with the general scope of the developing painting then work on it will continue, with Tania reporting to you periodically. Tania may be contacted via the form below or through her website. 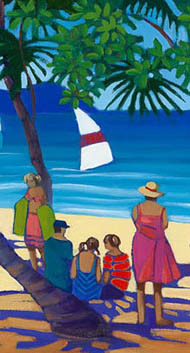 Tania Heben - original tropical paintings for sale. Contact Tania direct.